The President of Myanmar His Excellency U Thein Sein addressed the opening of the National Workshop on Urban and Housing Policy and Planning organized by the Government of Republic of the Union of Myanmar. The National level event was held at the Myanmar International Convention Center in its capital Nay Pyi Taw on 21 November 2014. In his opening speech the President emphasized Urban Development and Housing as its priority development agenda for the country. The President told the workshop that it should lead to development of National Policy, laws, rules and regulations covering the entire nation for the development of urban and housing sector that can effectively contribute to socio-economic development of the people. Uniform policies, rules and regulations shall be developed for state and regions based on the national policy. “It is necessary to implement affordable housing initiatives in which houses can be purchased and in installments or with mortgages by poor, disabled, retiree and low income general public” he said. The high level national workshop was attended by Vice President His Excellency U Nyan Tun, Senior Union Ministers, Union Ministers, Chief Ministers of Regions and States, Mayors, more than 300 senior government officials, representatives from development partners and the private sector organizations. The one day workshop focused on two sub-themes: Urban Development Policy and Basic Infrastructure Development and Housing Policy and Development Work. The workshop provided a high level platform for discussions on issues around urban planning and housing development. The workshop discussed key challenges emerging due to rapid urbanization as a result of country’s political and socio-economic transformation. UN-Habitat was honored with the sole slot for the opening ceremony of the national workshop in presence of the President. Mr. Bijay Karmacharya, Country Programme Manager of United Nations Human Settlement Programme Myanmar made a presentation highlighting the importance handling rapid urbanization in timely manner and to capitalize the economic potential of urbanization for economic growth and social development. He emphasized the need of a National Urban Policy supported by a three pronged approach of 1. Urban Design 2. Urban Legislation and 3. Financing at the city/ local level. It was noted that a well-coordinated approach between the Union and the local level through a National Urban Policy, systematic capacity enhancement and interventions at city level supported by proper planning, finances and legislation will lead to positive multiple outcomes of urbanization. 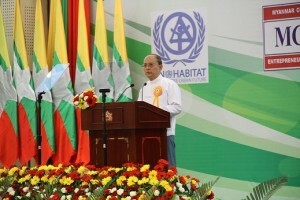 UN-Habitat video clips “The city we need” and “Paper City” dubbed in Myanmar language were screened during the opening ceremony for the benefit of the distinguished guests and participants. The conference recognized the usefulness of conducting sector specific studies, setting up of national level working committees and continued participatory dialogue among key stakeholders at multiple levels of governance along with communities, civil society and private sector to make policies realistic and implementable. Furthermore the decision makers of the government noted UN-Habitat as a key player in bringing global experience and expertise to the process of policy formulation related to urban development and housing and requested UN-Habitat to continue providing such expertise to the country.